The size of the pancake depends on the size of the cooking pan. This is also true for the economic growth in China, with GDP being the “pancake” and institutions being the “pan”. As the pancake gets bigger, the chef has to keep upgrading her cooker to accommodate the new needs and challenges—this process corresponds to reform. Since 1978, “reform and opening up” has been the guideline of the Chinese government in both political and economic policies. State-owned Enterprises (SOEs) have been the reform target in the economic dimension ever since. Compared to the European and the US institutions which evolve slowly but steadily over the last 300 years mostly in a spontaneous way, this process for China is much faster and drastic because it only takes 30 years and led by the government. 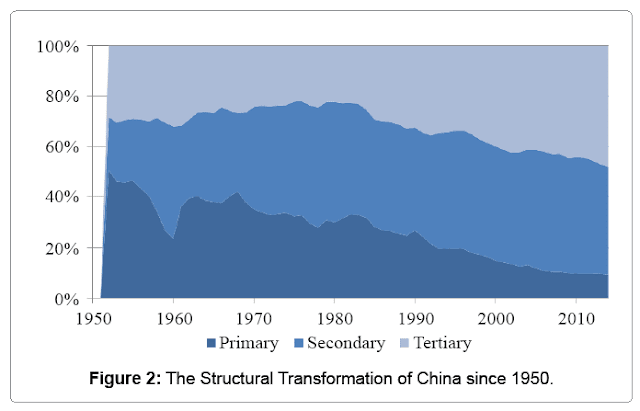 As a result, the traditional economic growth drivers identified by the neoclassical economists such as technology and innovations do not compare with the importance of institutional reform in explaining the Chinese “growth miracle”. Without the timely and appropriate reform of the obsolete institutions, there would have been a slower adjustment and the growth rate would have been much milder. Hence, the fast economic growth in China is featured as government-led or top-down, either proactively or reactively, different from the western model which is mainly market-driven or bottom-up. But why doesn’t China directly change its small “pan” to the largest “pan” in the world, such as the one used by the US—full democracy and openness? Apart from the political reasons, the Chinese government believes that the reform needs gradualism—using an enormous pan to cook a very small pancake may not work well or may be even worse if the chef is not ready. This cautiousness is not unreasonable, given the bad examples of Afghanistan, Iraq, Libya, Egypt and many others. In retrospect of the Chinese history after WWII (Figure 1), this “pancake theory” can well explain the interactions and interdependence between the economic growth and institutional reform on SOE. The Soviet-type planned economy before 1978 had provided the scarce resources and executive power to pull a big country like China out of the poverty trap and paved the industrial foundation within a very short time (30 years) and in a very complicated political environment (the cold war), despite many mistakes and detours had been made (e.g. Mao Zedong’s “great leap forward” in 1957 and “cultural revolution” 1966-1976). The “pan” was far from perfect but China had very few choices anyway, and it well served the purpose for industrialization in a unique historical setting. A consequence resulting from the planned economy was a great number of state-owned enterprises. In fact, they were more like extensions of the political institutions than “enterprises” because their production and pricing decisions followed the political directions rather than the market information or profit maximization. During this period, the SOEs contributed over 80% of the total GDP, in which the share of the secondary industry (mainly manufacture and capital goods) has risen from 21% to 48% (Figure 2). After achieving industrialization, the next stage of economic development is structural transformation towards the consumer goods sector and service sector, which are less capital intensive and more demand-oriented. The rigidity of the old SOE institutions no longer fit the new features of the fast changing economic conditions. 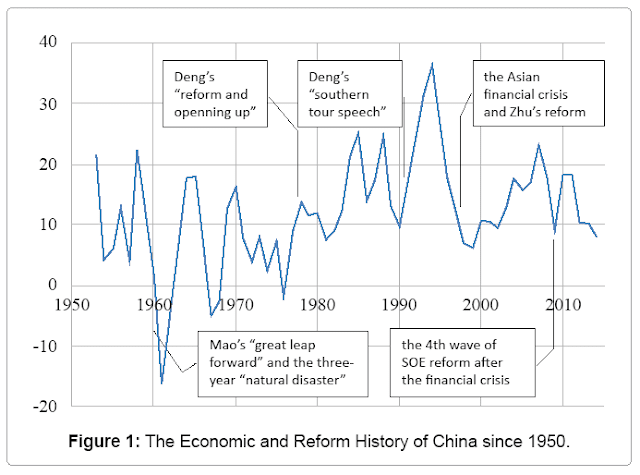 Deng Xiaoping initiated two waves of SOE reforms beginning in 1978 and 1992, resulting in the two booms (Figure 1). During this period, many markets which use to be monopolized by the SOEs were opened to the private and foreign capital, but the majority of SOEs were still operating with a very lower efficiency and profitability, thanks to the government’s financial support and a fast growing internal and external market demand. A turning point occurred in 1997 when Asian financial crisis kicked in, and the abrupt reduction in China’s export market became the last straw on those struggling SOEs. The former premier Zhu Rongji was forced to initiate the third wave of SOE reform, shutting down 60 thousand SOEs and laying off 30 million employees. The reform was not smoothly done because it hurt a whole generation’s interest and heart—those who were born in the 1950s and devoted their whole life in SOEs. There had been fierce protests and “social instability” issues, but they were finally tackled by the government, properly or improperly. Eventually, the burden SOEs were cleared, and only those with high economic performance or strategic roles are kept and reinforced. In 2003, an ad hoc ministerial department, State-owned Assets Supervision and Administration Commission (SASAC), was established to focus on the SOE reform. Since then, nearly half of the SOEs owned by the central government were sold off in the form of stocks and MBO, in the light of the market-oriented reform philosophy to separate the roles of shareholder and manager. As a result, the share of the industrial production of the SOEs dropped from 76% in 1978 to about 30% in 2015 (UK: 4%). 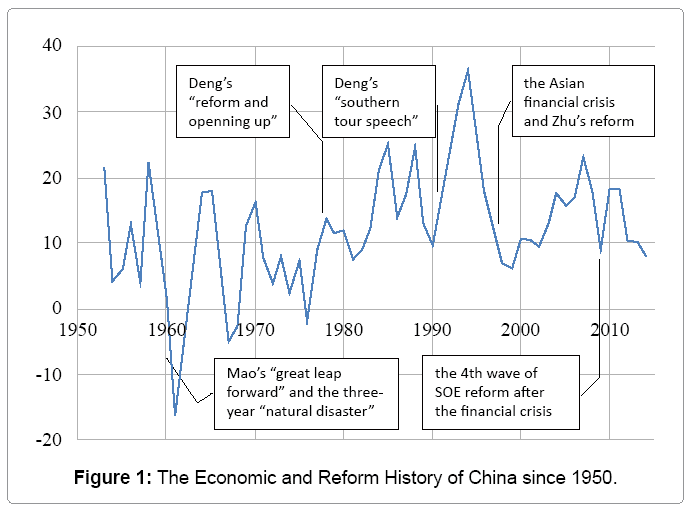 In the last two regimes, the role of the SOEs rose and fell to serve the “big picture” of the macroeconomic development, but mainly in a quantity sense. From 2015 onwards, there have been three new features in the present SOE reform (counted as the fourth wave) to deal with the new opportunities and challenges in the domestic and global market. First, it focuses on the quality of SOEs and the competitiveness in the global market to support the government’s international strategies such as AIIB and One-Belt-One-Road. China has never been so active in the international community and the SOEs are once again used as the economic extensions of the political institutions. In order to achieve this objective, the government has been strengthening the central SOEs’ control over the “core” strategic industries, such as military goods, energy goods, steel, railway, automobile, boat, and telecommunications and banking (over 75% of the market share). This is done by integrating smaller SOEs into gigantic monopolies that dominate the domestic market and competing in the global market, such as AVIC in aviation and CRRC in rolling stock. In 2015, Xi Jinping visited the UK to sell China’s high-speed train and nuclear power station, which are all provided by the SOEs. Second, the means of SOE reform emphasize the use of financial market, especially in the form of asset securitization and “mixed ownership”. By far, the most popular mode is “reverse acquisition”: the SOE separates its best businesses to form a smaller but stronger son company which can easily go public, and then the listed son company reversely acquire the parent company to make the whole SOE public (example: Wuhan Iron and Steel). Another mode is “A+H” if the majority of the company’s assets are of high quality: the SOE issues IPOs simultaneously in both mainland China stock market (A-share) and Hong Kong stock market (H-share) to attract different types of investors (example: Bank of China). Vertical and horizontal M&A’s are also frequently used to integrate the SOEs in related industries to reinforce the competitiveness (example: China Railway Rolling Stock). Finally, the economic reform on SOEs is twisted with political reform, because the managers of the SOEs are also government officers. Corruptions are more likely to happen in the SOEs with institutional flaws and unsupervised power. Since Xi Jinping took over the government, hundreds of ministerial and provincial level of government officers have been investigated, including the former officer of the SASAC and many CEOs in SOEs. The width and depth of this wave of reform in China are unprecedented, partly because of the new challenges in the domestic and international economy, and partly because of the emerging opportunities are seen by the Chinese government. • Integration of SOEs has been taking place within the infrastructure and energy sectors for the purpose of global competition with the traditional MNCs. • The reform of SOEs encourages the mixed ownership, in which way the private capital can participate in and benefit from the SOE-dominated businesses. • The reform is opening up some SOE-monopolized markets for the private and foreign investment, including the telecommunications and financial sectors. • The reform of SOEs is accompanied by the political reform, during which corruption issues are dealt with by the central government. 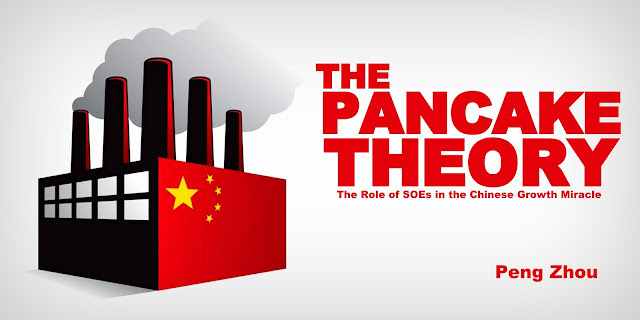 This article is an excerpt taken from a research paper, titled "The Role of SOEs in the Chinese Growth Miracle: A “Pancake Theory", published under Creative Commons License.